A collection of food carts sharing one location offers convenience and variety, and this is the set-up at A La Carts on the corner of SE Ivon and SE 50th Ave. They have a centralized seating area that’s best described as a sort of banquet tent complete with heaters, magazine rack, stereo and disinfecting wipes. They thought of everything. We chose La Arepa for our first ever taste of Venezuelan food. 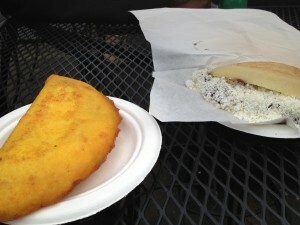 Our #3 Domino Arepa and #13 Empanada had the same filling (black beans and white Cojita cheese) but with very different, very yummy packaging. We were surprised at how heavy they both were, as the cornmeal coatings and delicious fillings were both extremely dense. The arepa is described as a “flat, round bread-like patty made of cornmeal, which is grilled, then filled.” This was our favorite, though it was a bit messy to eat. The filling oozed out with each bite, but the texture of the arepa was extremely satisfying. The empanada is a “turnover-like cornmeal stuffed pocket” and because it is deep fried, reminded me fondly of the coating on a corn dog. For another first, I ordered the sugarcane juice with lime. 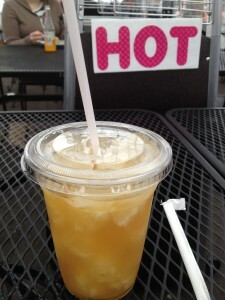 It was reminiscent of super syrupy lemonade, so my sweet-tooth loved it. The person who took our order was very kind and repeated it back to us to ensure accuracy, which I so appreciate. The cart has other vegetarian, vegan and gluten-free options and even serves breakfast! So far, so good, but the day is shaping up to be a bit lacking in fruits and vegetables. And I’m pretty sure we’ve reached our Daily Value for fried foods. Do you have a good food cart recommendation for lunch in your neck of the woods?